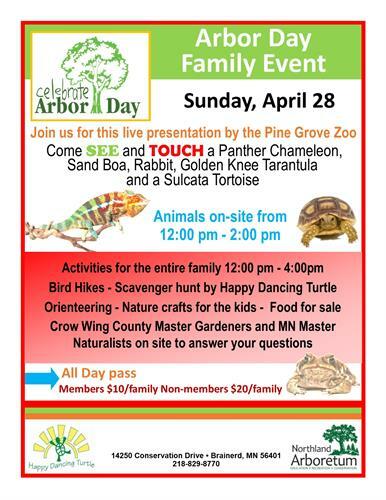 Celebrate Arbor Day on Sunday April 28th at the Northland Arboretum!! This family event will include activities from noon to 4pm!! There will be a live presentation by the Pine Grove Zoo. Come see and touch a Panther Chameleon, Sand Boa, Rabbit. Golden Knee Tarantula and a Sulcata Tortoise. Animals will be on site from noon to 2pm! Other activities include: bird hikes, scavenger hunt by Happy Dancing Turtle, orienteering and nature crafts for the kids. There also be food for sale!! Crow Wing County master gardeners and MN master naturalists will be on site to answer your questions.